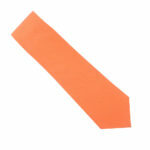 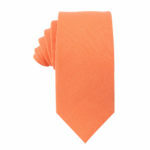 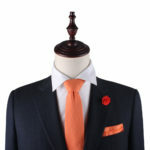 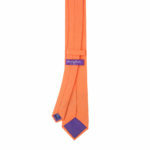 The Peach Orange Tie is about to become your new favourite go-to accessory for the springtime. Don this handsome tie at any event you can think of and look especially dashing when you pair it with a cream or grey coloured suit. This tie is an excellent groomsmen accessory for springtime and summer weddings, appropriately matching the colours found in the wedding party’s clothing or those found in the florals adorning the bride’s hands. On the other hand, you can gift this peach orange necktie to anyone who would like to add a little colour to their everyday suit.